Even if you keep your potted plants indoors at all times, they’re still susceptible to a variety of insect pests. In fact, you can have even more insect problems with potted plants, because bugs will be more attracted to plants kept in warm indoor or greenhouse environments. You may also notice that you’re more likely to encounter insect problems year-round in your potted plants. You can’t see spider mites with the naked eye, but you can see the symptoms of an infestation on your potted plant. Spider mites cause the plant’s younger leaves to turn brown or fade in color and in more severe infestations you’ll see a delicate spider web-like covering on the undersides of the leaves. To treat your potted plants for spider mite infestations, spray the leaves with a vigorous jet of water, use yellow sticky traps, apply an insecticidal soap or spray the plant with horticultural oils or the insecticide bifenthrin. If you see tiny whitish, moth-like flies on your potted plant’s leaves, you have a whitefly infestation. To get rid of whiteflies, place yellow sticky traps around the plant, apply an insecticidal soap to the leaves or spray the plant with horticultural or neem oils. Mealybugs look like tiny white cotton tufts on the undersides of the leaves or on the stems. If your potted plant has a mealybug infestation, you can spray the plant with horticultural oils or an insecticidal soap. Another solution, although perhaps more tedious, is to dab the mealybugs with Q-tips soaked in alcohol. Scales are oval, tiny brown insects with hard shells that are most often found on the leaves and stems of potted plants. Scale infestations cause stunted growth in potted plants and can attract ants or fungal diseases from the sticky liquid that the insects secrete, called honeydew. You can treat scale insect infestations with the same alcohol and Q-tip method as mealybugs, or you can spray the potted plant with horticultural oils or the insecticide malathion. 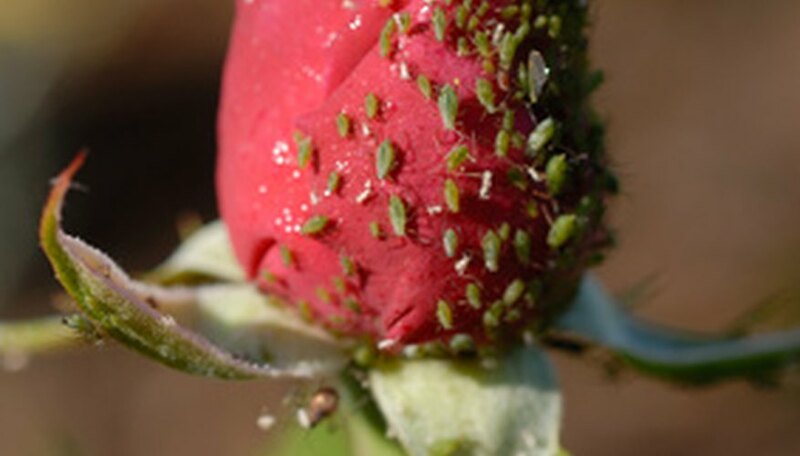 Aphids are sap-sucking insects that distort or stunt plant growth, usually found on new growth and the undersides of leaves. Aphids often feed in clustered groups on potted plants, sometimes covering the foliage with the same sticky honeydew that mealybugs secrete. Treat your potted plants for aphid infestations by spraying the plant with a vigorous jet of water, setting out yellow sticky traps, applying an appropriate systemic insecticide, or spraying the plant with pesticides like malathion or diazinon. Like spider mites, thrips are difficult to see with the naked eye, but you may see the light-brown, slender insects flying from plant to plant. If your potted plant is infested with thrips, you’ll see the leaves becoming distorted and scarred from the thrips feeding on the plant juices. Get rid of thrips on your potted plant by spraying the plant with an insecticidal soap, malathion or diazinon.